Arica Bibbs strode up the sidewalk to her Houston home, her two sons in tow — one lagging behind and the other racing for the steps to their second-floor apartment. Monday was a big day for Bibbs, a single mother who has struggled with poverty, homelessness and, sometimes, hopelessness. But on this day, she’s none of those things. 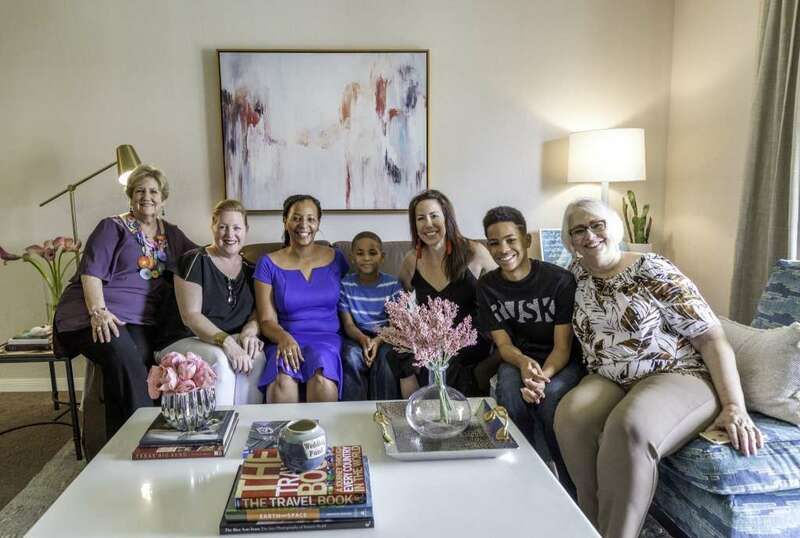 She’s starting the newest chapter in her life, one that has reached a peak with an apartment makeover courtesy of one of Houston’s newest nonprofits, the Houston chapter of Dwell with Dignity. Last week, she left for a Woman Evolve faith conference in Denver and knew that the Houston chapter planning committee Nancy Cameron, Julie Dodson, Sharon Sudbury Staley and Leslie Carothers and their crew of volunteers and donors had been busy in her apartment. For the project, she was asked to get rid of all her furnishings and décor — pay it forward by giving it to someone else who needed them. And in return, her interior design fairy godmothers brought in furniture, art, accessories, even kitchen and pantry essentials, for an entirely new environment. Just a few days ago, the Houston Dwell with Dignity workers were scrubbing floors, painting walls and vacuuming carpet. They’d spent months gathering furniture and accessories for their first local project, a home installation they hope will kick-start a fundraising campaign. 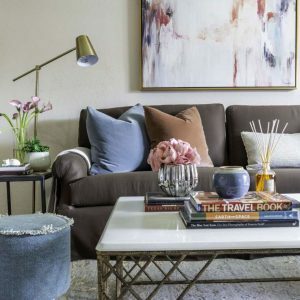 “We’ve gotten our first project behind us, now we have a story to tell and photos to show,” said Kim Turner, who co-founded Dwell with Dignity in Dallas a decade ago with Lisa Robison. Turner came to Houston for Monday’s big reveal. Turner founded the group a decade ago in Dallas before spreading to Atlanta and, now, Houston. The idea here began in 2013, when Cameron had heard about the organization and knew there were enough big hearts in Houston’s interior design community for another organization that helps families live in better conditions. Next they’ll launch a fundraising campaign for staffing and warehouse space to store donations from individuals and corporations. Their goal now is to have a monthly home makeover project. Dodson and her friends brought in boxes of accessories and supervised movers from Luxe Delivery and Storage who brought in the beds, sofa, chairs, tables and other large items they’d trucked over. With every load and unpacked box, the 1,100-square-foot home of Bibbs and her 6- and 13-year-old sons took shape. “I had an idea that surely, with all the interior design we do — with furniture coming and going, old being replaced with new — surely, we can harvest it and give it back to the community,” said Cameron, of Nancy Cameron Interior Decoration. Today’s project was the local chapter’s first installation, but it didn’t happen overnight. From the start, Dodson, of Dodson Interiors, has taken the lead gathering furniture donations and raising money. She generated $7,500 at a dinner with Carson Kressley at the Arbors during Texas Antiques Week in Round Top. Carothers handles social media, and they all have rolled up their sleeves to clean, pack and haul home furnishings into Bibbs’ upstairs apartment near NRG Park. The women removed everything, from furniture to kitchen essentials and even food, and are replacing it all — with donated goods and a budget of $5,000. The goal of Dwell with Dignity is to transform lives through design: take homes from places that simply provide shelter, to spaces that are beautiful and functional and make those who live in them feel valued. The group found Bibbs through Main Street Ministries, a faith-based social-services agency that helps people overcome challenges, including poverty, homelessness and substance abuse. One of its programs is Family Hope, six months of classes through which people set goals and create a plan to achieve them, said Kathie Hartzog, director of programs at Main Street Ministries. Bibbs was in the first group of Family Hope graduates. Some 30 people have gone through it and another 20 are participating now. Hartzog said that four more sessions are planned for 2019. The 33-year-old Houston native has had setbacks in her life. She was homeless as a child, then, after giving birth to her first child, she found herself homeless and without a job. She stayed at the Star of Hope homeless shelter for a month. She earned a degree in biology at Prairie View A&M University, then later, while earning a master’s degree in counseling at Texas Southern University, she lost her job and was homeless again. Always a paycheck or tragedy away from being homeless, Bibbs felt trapped in poverty. Without a car and living in public housing, all she could find was a minimum wage job in a thrift store that was within walking distance. Each time she got a better job with better pay, her rent was increased. When she earned enough to buy a car, she no longer qualified for food stamps. She was engaged to be married and pregnant with her now-6-year-old son when her fiance was killed in a car accident — one more tragedy added to a long list. But she found Main Street Ministries, and its Family Hope program helped her set goals and see how she could achieve them. Before the transformation, Bibbs had only the basics. There was a small sofa and TV in the living room. Her sons had small beds and little more. In her own room, she slept on the bare mattress from a sleeper sofa that she laid on the floor of her room. 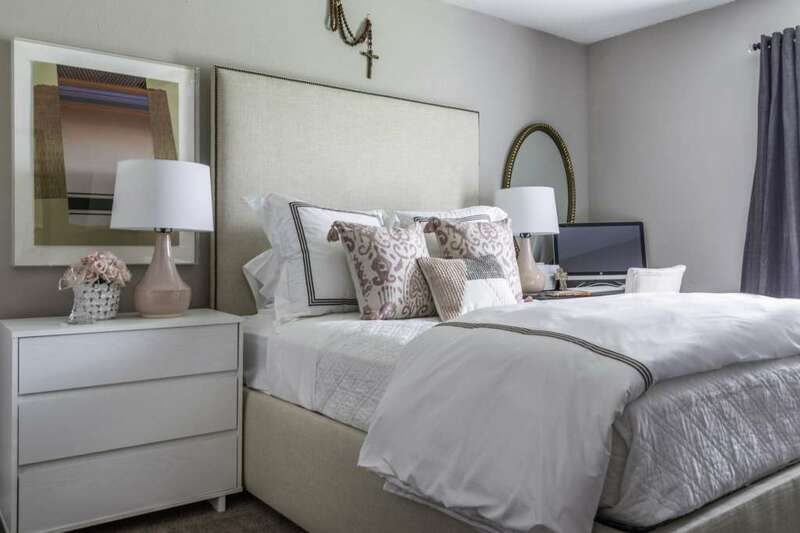 Now, though, a beautiful bed with an upholstered headboard and blush-pink bedding is centered in her room, and a nightstand with a lamp sits nearby. Her clothes are hung on matching hangers, and fluffy new towels are stacked neatly in the Jack-and-Jill bathroom the family of three shares. An upholstered sofa, chair and rug provide a place for the family to hang out in the living room, and a table and chairs off of the kitchen is where they’ll share meals. The boys’ room is decorated in blue and red with matching twin headboards and bedding. A rack on the wall holds Texans T-shirts and hats, plus a couple of Astros hats. It’s not just the big stuff — furniture and accessories — that are new. Dwell with Dignity brought in new dishes, glasses, pans and kitchen essentials. They even asked Bibbs for a grocery list, and when she arrived home Monday, it was to a refrigerator and cabinets filled with fresh food. Cameron, Dodson, Staley, Carothers and others called on friends and their own regular vendors to gather everything for Monday’s project. Some of the furnishings are new, but other things were gathered from resale shops and big box stores like Target and Ikea. Donors include the delivery company, which provided free labor, but also furniture and accessories from a long list of stores and showrooms: Rug Mart, Downright, Peacock Alley, the Joseph Company, Lam Bespoke, Stetzel and Associates, the Longoria Collection and the Ken Kehoe and Codarus showrooms. A special donation came in for the boys — a Texans football autographed by J.J. Watt — a treat that Dodson acquired through her interior design clients Matt and Laurie Schaub. Matt Schaub is an Atlanta Falcons quarterback who earlier in his career played for the Texans. Perhaps the best gift of all was in a small utility room accessed from her balcony: a washer and dryer.